Restoration comedy. Where the modern sit-com comes from. Except the Restoration writers were truly funny. The Country Wife, from 1675, is written in the time after the Restoration of Charles II when all of London wanted to break free from the shackles of Puritanism. And break free they did. My Brit Lit professor describes this book as "bawdy." I love that word and it fits this play perfectly. It revolves around a hero or anti-hero, depending on your point of view, named Horner. Yes, the name is very intentional. His goal in life is to bed as many other men's wives as possible. His grand scheme to do so is to tell everyone that he is impotent. Sounds weird but it really works amazingly well. Surrounded by a cast of characters with names like Pinchwife, Sparkish and Squeamish, his plot unfolds with hilarious results. 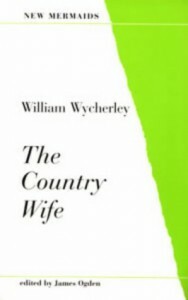 If you read a line that seems to have a double meaning, you can be assured that Wycherly meant it that way. This stuff was meant to be as risque as it sounds. I thoroughly enjoyed this one. There are scenes of comedic genius. It is saucy. It is Restoration Comedy at it's best.